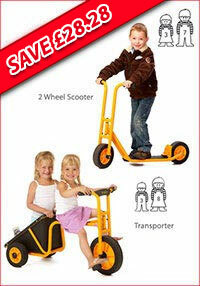 The 2 Wheeled Scooter brings speed and balance combined with physical play for younger children. With broad and stable wheels, it is easy to maneuver even on loose gravel surfaces, where other scooters give up. It allows for quick decisions to move into new directions; or to use the rear brake bringing it to halt instantly. The tread surface is made of non-skid rubber, so children quickly gain a feeling of safety and security. The scooter is more stable to stand on as opposed to conventional scooters. The Runner often becomes children's first experience on a two wheeler, as they are still able to use their feet to maintain balance and to push the cycle forward. Many playful hours on the Runner gives the child added and natural confidence to embrace a cycle with pedals full-heartedly. 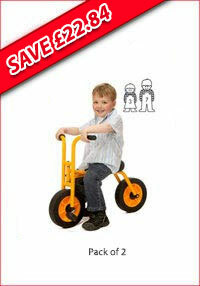 Having gained confidence in riding on wheels on RABO's other tricycles or "runners", the 2-Wheeler becomes children's first experience toward a traditional bicycle. To bridge this experience the 2-Wheeler's broad tires make it easier to maintain balance and cross curbs; or ride on uneven surfaces. 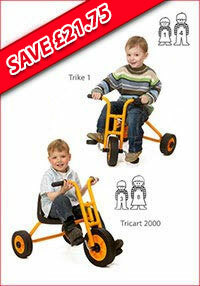 The Tricart 2000 is the pre-school's coolest tricycle. The well shaped seat and back rest appeals to children seeking a bit of extra speed. 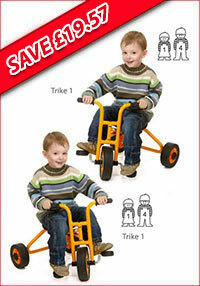 The Walking Trike is children's very first tricycle before the more complex trike with pedals comes into play. 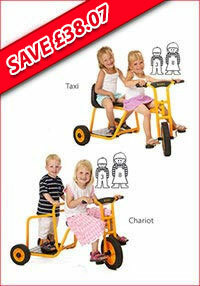 It is ideal for day care and nursery school children not yet able to tread the pedals. The Walking Trike is a wonderful first step onto wheels and the sense of security this bike develops confidence toward moving onto a pedal driven cycle. The 3-Wheel Scooter is a totally unique scooter with its stable three broad wheels and a spacious standing surface, so that even the smallest ones enjoy a sense of security while standing on one foot and pushing with the other. 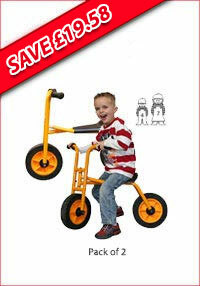 The 3-Wheel Scooter is lightweight and low to the ground and the handles are designed so little hands can easily hold on tight while pushing one's way through the play area. The transporter is a Heavy Goods Vehicle. It is a real kindergarten delivery vehicle, as it is always fun to transport things or friends around the playground. 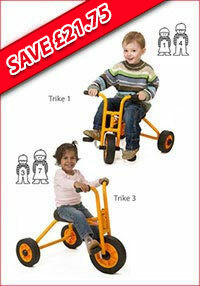 Trike 1 can be considered the best nursery school tricycle on the market. Its scale caters perfectly to this age group and its broad wheels allows children to manouvre across a variety of surfaces. As one of RABO's true classics, the Trike 1 has been embraced by children and caregivers in child care settings for many years. 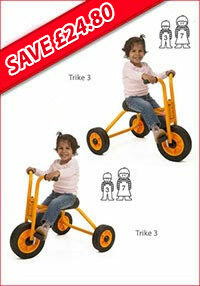 Trike 3 has become classic on the playground due to its level of play value, durability and smooth design. Trike 3 becomes the tricycle children bridge with their future bicycle era outside the supervised environment of the center. 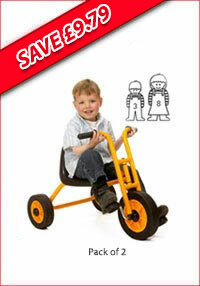 RABO Tricycles has produced and supplied the "No. 3" to children around the world for more than 20 years. Trike 1 can be considered the best nursery school tricycle on the market..
Its scale caters perfectly to this agegroup and its broad wheels allows children to manouvre across a variety of surfaces. 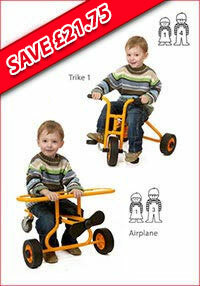 The Airplane is wonderful for toddlers who are learning to walk. The rotating wheel at the rear end encourages children to learn the connection between wanting to go in a specific direction and using the whole body to get there. This trike helps supports coordination and motor skills while catering to toddlers' natural desire to move around the playground and explore. £484.88 When purchased separately. Offer price only £445.50! The RABO Taxi is a wonderful vehicle for children to socially interact, role and language play; and to move about the playground; to distant places in the world - or across to the playhouse. The Chariot is great for social and physical play potential, since it may be used by two children and offers a great variety for playing Ben Hur, race riding, playing bus or just biking and having fun. The two side and front bars in the rear section of the trike combined with the flat large surface can accomodate children with a variety of physical challenges integrating all children to take part in the playground's fun and movement. 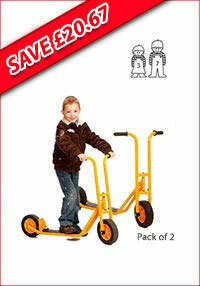 Circle Cart is a true action tricycle encouraging unique maneuvering while giving lots of fun and challenging joy of moving. 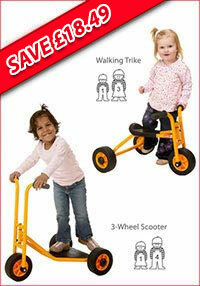 The Circle Cart is truly a different tricycle requiring the child to use handles rather than pedals to create movement; forward, backwards or turning corners. It helps development of children's motor skills while teaching them to coordinate and create movement in more complex ways than on conventional tricycles. 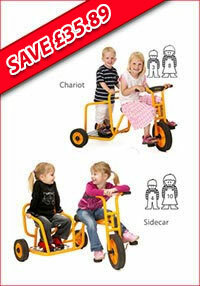 The Chariot is great for social and physical play potential, since it may be used by two children and offers a great variety for playing Ben Hur, race riding, playing bus; or just biking and having fun. 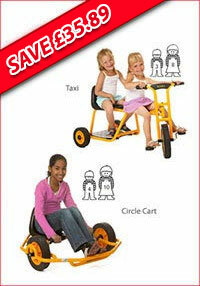 The Sidecar trike has great potential for social play as two children can use it at the same time. It bridges also children's developmental move from parallel play to social interactive play, as the youngest child can be seated alongside with an older friend "behind the wheel". The Sidecar brings an extra dimension in eye hand coordination, motor skills and planning as the trike requires more space on the right side than the left when negotiating playground obstacles.